Radish Sambar is an authentic Tamil Nadu special recipe. Some like it spicy, while others add a touch of jaggery to sweeten it, some avoid adding tomatoes. Sambar masala generally made using ground coconut and spices(Araichu vitta sambar), freshly ground spices, pre-ground sambar powder. 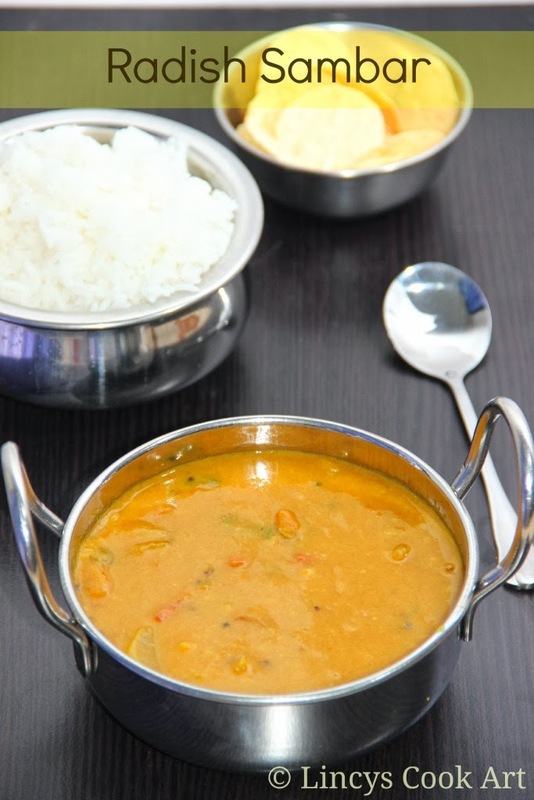 In most South Indian homes sambar is a dish that finds a place on the meal table almost every day. To make a Simple single vegetable sambar,Vegetable choices varies from pearl onions, radish, brinjal, flat beans, bhendi, drumstick leaves, drumstick to a whole array vegetables. Each vegetable sambar gives different taste and you have a completely different flavor profile to relish. Pressure cook the toor dhal with turmeric powder (on medium flame for 3 whistles). Open the cooker when the steam releases. Soak the tamarind in quarter cup of water. Pour two teaspoons of oil in a pan and add the onion and sauté it till becomes soft. Then add the garlic and cook for a minute. Then add the tomatoes and cook till it starts to become mushy. Now add the chopped radish and sauté for two minutes. Then add a cup of water and salt; close the lid and allow to cook for 5 minutes. When the radish is almost cooked, add the turmeric, chilli powder, coriander powder, sambar powder and tamarind extract; allow to boil this mixture till the raw masala smell and the raw smell of tamarind leaves. 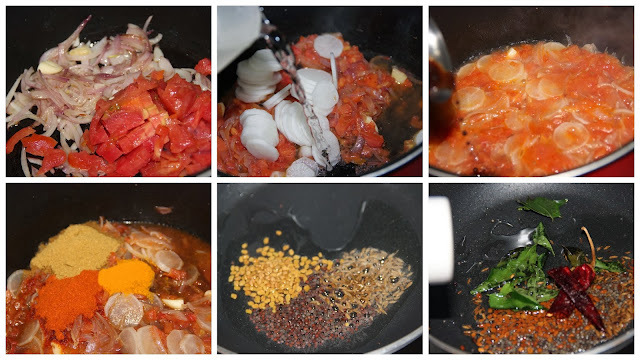 In a separate pan pour two teaspoons of oil and add mustard seeds, fenugreek seeds, cumin seeds. When mustard seeds crackles and fenugreek seeds turns slight brown colour add the curry leaves and switch off the gas; add asafetida in that hot oil. Transfer this tempering into the sambar and allow to boil well once. Check the salt and sprinkle with coriander leaves and switch off the gas. Note: I like the sambar to be thick. You can adjust the water, according to your required consistency. After adding tamarind water allow to cook the sambar well till the raw taste of tamarind leaves. Do not add tamarind before cooking the vegetable. If you add before the tamarind will not allow your vegetable to cook. Do not over fry the fenugreek seeds (Dark brown), that may turn your sambar bitter. 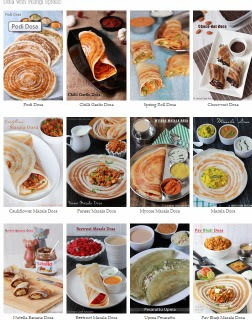 I am linking this recipe to this event, Cook N Share What u Like Event & Giveaway. love sanber with radish..tempting clicks..
love radish sambar. Love the first click with rice and papad. Very tasty and spicy side. Tempting clicks. 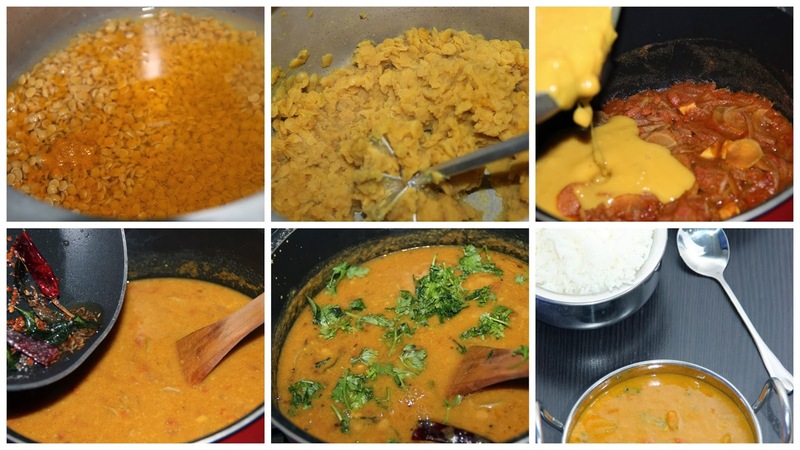 Looks yum..lovely clicks n steps to make delicious sambar. .